In 1992, Ward finally received an opportunity at quarterback. 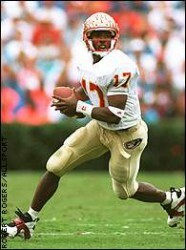 He led the Seminoles to an ACC title, Orange Bowl win and was named as the Conference Player of the Year. He became a second team All-America, was a finalist for the O’Brien Award, and finished sixth in the Heisman voting. His senior year saw Ward lead FSU to its first national championship as he captured the Heisman Trophy and the Maxwell, Camp and O’Brien awards. At the time, his victory margin in the Heisman vote was the largest ever. In that 1993 season he threw 27 scoring passes with only four being intercepted. While highly desired by the pros, he cast his lot with basketball enjoying an 11-season career in the National Basketball Association. Ward was such a complete athlete that he was also drafted in the major league baseball draft even though he did not play college baseball. While at FSU he served as student body vice president.